Anti-apartheid activist Ahmed Timol died in South African police custody in 1971, and his family continues to demand justice. While police claimed Timol died by suicide, evidence indicated that he was tortured and murdered. 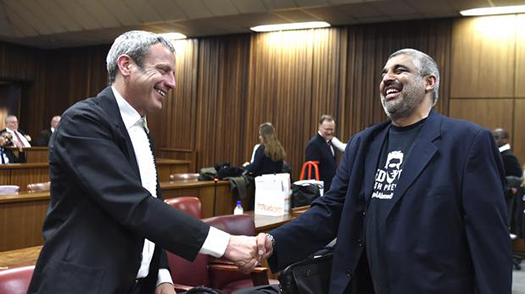 The family’s tenacious efforts led to the reopening of an inquest into Timol's death this year, with ICTJ senior program advisor Howard Varney (pictured above, left, with Timol's nephew) representing the family. What were the family’s goals in reopening the case? Howard: The family never accepted the findings of the Magistrate and sought the reopening of the inquest in order to demonstrate that Timol had been tortured and then murdered. They had lived with a fraudulent finding that tarnished the memory of their loved one. They had taken their case to the Truth and Reconciliation Commission and had previously pressed the NPA to investigate the case since none of the police officers had sought amnesty. When the NPA was approached in 2003, all the most responsible policemen were still alive and could have faced justice. The NPA did not carry out a serious investigation at this time. The known interrogators of Timol had all died by the time of the reopened inquest in 2017. The family took the view that the case was not seriously investigated because the government had adopted an unofficial policy to suppress the political cases of the past. Evidence of such political interference was revealed in another case in which the family of a young disappeared woman (Nokuthula Simelane) were seeking justice. How did you get involved in the inquest? Howard: Since I was already representing victims of apartheid-era abuses I was approached by Imtiaz Cajee, nephew of the late Ahmed Timol, to represent the family in their efforts to seek truth and justice for Timol who died in security police detention in 1971. The police claimed that Timol committed suicide by jumping to his death from the 10th floor of police headquarters in downtown Johannesburg (then known as John Vorster Square). This claim was endorsed by the Magistrate presiding over the official inquest into the death in 1972. That Magistrate found that Timol had not been tortured and that he had been treated with care and compassion. The Magistrate also found that Timol committed suicide to avoid a long jail sentence and because it was communist doctrine to commit suicide rather than betray comrades. I then received instructions, in my capacity as a practicing advocate, from the Pro Bono department at Webber Wentzel attorneys, and the Legal Resources Centre, to pursue the reopening of the inquest. After we submitted further evidence to the National Prosecuting Authority (NPA) they agreed to reopen the inquest. Evidence has to be sparse when working an apartheid-era case, as you’re not only working against the decades but against the fact that the perpetrators were part of such a regime. How do you as a representative meet that challenge and present a compelling case? Howard: It was a particularly difficult case to investigate. I worked closely with one of South Africa’s most experienced investigators, Frank Dutton. Dutton spent considerable time tracking down the witnesses and following up leads. I relied heavily on his investigations. As is typical with these cases, the only direct evidence as to what happened is that of the police, which we believed was fabricated. All the known interrogators had died but we were able to track down the police sergeant who was allegedly guarding Timol when he was said to have committed suicide. We also tracked down two other Security Branch officers who were on duty at the time and who were accused of torturing other detainees. Our challenge was to demonstrate that the police version was false. Since we had no direct evidence we had to rely on similar fact evidence and forensic expert evidence. We first presented ‘similar fact evidence’ of several former detainees to show that torture was routine practice of the Security Branch at that time. In particular we lead evidence from 3 witnesses who were viciously tortured on the same floor where Timol was held (10th floor of John Vorster Square) during the same time period that Timol was held. The evidence of Salim Essop, the young man who was detained with Timol, was particularly compelling. He was so brutally tortured that after a few days he fell into a coma and could not be revived and was rushed to hospital. After his father was tipped off by a nurse he rushed to court and was granted an injunction restraining the police from further torturing his son. This case received considerable publicity in the press. Also of great importance was the evidence we lead from our forensic experts, which included two forensic pathologists, a trauma surgeon and an aeronautical engineer. The forensic pathologists demonstrated that a number of serious injuries disclosed in the post mortem report and photographs were not attributable to the fall. They concluded that these injuries were consistent with torture. The aeronautical engineer gave compelling evidence on the trajectory of the fall. Following his calculations he concluded that the position of the impact site (as in distance from the building) and the orientation of the body could only be explained by a push, not a jump or a dive. A jump or a dive, as alleged by the police, would have resulted in substantially different positions and orientations. Following the fall the police did not call an ambulance and moved the critically injured Timol, who was still alive. The trauma surgeon confirmed that the police should have immediately called for emergency services and should not have moved Timol. This evidence allowed us to argue that the conduct of the police was consistent with the intention to kill Timol. We also located 3 unrelated civilian witnesses who saw or heard Timol fall. They all testified that the fall took place in the mid-morning and not in the late afternoon as alleged by the police. We closely examined the investigation into Timol’s death and demonstrated, though the evidence of our investigator and that of a former Security Branch officer, that it constituted a cover-up from start to end. Can you walk us through the legal process? What had to happen in order to make last month’s ruling possible? Howard: A judicial inquest must be distinguished from a criminal prosecution. Following an unnatural death, where there is no criminal prosecution, an inquest must take place in order to make an official finding into the cause of death, and if possible, to identify anyone responsible for the death. An inquest is potentially useful for a family seeking the truth, where the State has failed to investigate, since the family, through their representatives, may carry out their own investigations, subpoena witnesses, lead evidence and also cross examine the suspects. Although an inquest is held in a court and complies with procedural rules used in criminal cases, since it is not a prosecution, the standard of proof is less stringent. A finding may be made on a balance of probabilities rather than beyond a reasonable doubt. Any party with a legal interest may take part in an inquest. In the Timol inquest there were legal teams representing the State (the National Prosecuting Authority); the family and the police suspects. With the permission of the judge all were allowed to lead evidence, enter documentary evidence into the record and cross examine witnesses of other parties. An inquest is inquisitorial in nature and the presiding judge plays a greater role in reaching the truth then in a typical criminal trial, which is largely adversarial in character. In the Timol Inquest the hearings ran for some 20 days producing thousands of pages of transcripts and documentary evidence. In the end the judge accepted the submissions of the family that Timol was brutally tortured and could only have been murdered.The court also accepted our submissions that the murder was hatched to cover up the torture and prevent the adverse publicity that would follow when the torture was exposed. Does Timol’s family feels as though justice has been served? Howard: The family is happy with the outcome of the inquest and feel that their efforts to seek the truth have been vindicated. However, they are upset that it has taken 46 years to achieve this result. In particular they are bitterly disappointed that the prosecutors did not take the case seriously when the main culprits were still alive. A basic investigation carried out timeously would have delivered more compelling justice to the family and the country – since the main perpetrators could have been held publicly to account. Joao Rodrigues seems poised to be charged in connection with Timol’s murder. What is likely to be the way forward from this case? Any other developments we should keep an eye on? The police have opened dockets to investigate possible charges of murder, accessory after the fact (to murder) and perjury against Rodrigues. Perjury investigations have also been launched against the two other former Security Branch officers who testified, Neville Els and Seth Sons. It will be interesting to see how seriously such criminal investigations will be pursued and whether prosecutions will be launched against the three, and if so whether such prosecutions will be serious conducted. Unfortunately past history does not inspire confidence. What implications does this have for other apartheid-era cases? Howard: The Timol Inquest may open the door to several other apartheid era cases. Already the families of Neil Aggett, who allegedly committed suicide by hanging in 1982, and Mathews Mabelane, who fell to his death from the 10th floor of John Vorster Square in 1977, have sought to have these inquests reopened. Other potential cases include the deaths in detention of Steve Biko, Babla Saloojee, Hoosen Haffajee and others. All these cases will be difficult to pursue since they are decades old and many witnesses have died and records lost or destroyed. However, it is now or never, as family members wish to see justice done while at least some perpetrators are still alive. What does Timol’s case say about the state of transitional justice in South Africa today? Howard: The Timol case stands as a serious indictment of South Africa’s globally acclaimed approach to transitional justice.The Truth and Reconciliation Commission, which was in existence for a short period, could not have been expected to intensively investigate all cases. Those who were denied amnesty or declined to apply for amnesty were meant to face justice. Political manipulation saw the National Prosecuting Authority abandoning all the cases from the past. The Timol and Simelane cases only saw the light of day because of the unrelenting campaigns for justice spearheaded by the respective families, which included litigation. Perhaps the success of the Timol Inquest, which was widely followed by South Africans, may mark a turning point and force the authorities to take the pleas of victims’ families seriously.